To those familiar with his work, Peter Hutton was one of cinema’s giants. Because he made non-narrative, “experimental” films and started out in a different era (and mindset) of cinematic art, it wouldn’t be surprising for this obituary to be the first you are hearing of his work – but poke around the internet and you’ll see that for those his passing has hit, it has hit hard. In the light of his films, it feels appropriate for his death to offer one final, irresolvable contrast between the intimate and the titanic: the giant legacy no one knows about. Peter Hutton’s New York Near Sleep for Saskia (made for the daughter of countercultural artists Red Grooms and Mimi Gross) sounds like nothing to describe it: a series of painterly tableaus capturing Hutton’s small corner of New York City - time-lapse photography of light passing through windows, birds-eye views of traffic below, intimate images of a city that somehow managed an almost cosmic breadth of expression. It doesn’t sound like much to describe it this way, but: above all, it is a film that is beautiful. Seeing New York Near Sleep for Saskia in college was a life-changing experience for me, in the sense that before seeing it, like many people, I somehow felt threatened or insulted by art so simple and straight-forward that it became inscrutable – the kind of art that knowing that critics and curators thought it genius made it infuriating. “My kid could paint that!” is the most basic and common articulation of this fearful mindset, but “it’s just a photo of a boat” is another common expression the antagonized feeling that a certain kind of art generates in people – generated in me. Hutton introduced some of his films and a few others he liked and spoke after each. In direct opposition to the standard caricature of a downtown NYC experimental filmmaker, he was unpretentious and approachable; in my limited personal experience with him, Hutton was the rare and irresistible combination of wry, quick-witted and warm. Hutton’s eye is peerless - I would without hesitation call him the most exquisite image-maker in the history of cinema – but something of the man himself over-rides the “painterly” qualities of his work. It lacks entirely the lifelessness associated with carefully composed, breath-takingly gorgeous photography – no infuriating, inscrutable deadness, no obscurity standing in for genius. Hutton’s Q&A afterwards played some part in the process, but in seeing New York Near Sleep I finally understood that sometimes art was beautiful and there didn’t need to be anything more to it than that (even if in Hutton’s case there frequently was more to it than that.) You could it receive an artwork on that simple of a level – anyone, a college kid from the middle of nowhere like me, a child, five year-old Saskia, could understand it. Beauty. That’s enough. Not genius, not mastery, not revolution or reinvention, not calculation or theory or politics. Just beauty. It should be mentioned that I didn’t get the sense from either the Q&A or his films that Hutton was a romantic. His films represent a clear-eyed sense of beauty, a human approach to awe and the monumental. The mysterious (in beauty, in the natural world, in humanity’s contentions with nature) never became the mystical in his work – his films were a vision of a concrete reality: of structures and landscapes and machines and outgrowths and waves and shores and figures in motion and mountains. Concrete to the extent that light and shadow are concrete. Like many artists of the 60’s and 70’s who created the mythic New York of the popular imagination, he drifted away from the city as it changed in the early 90’s, heading up the Hudson River to settle elsewhere in its valley. 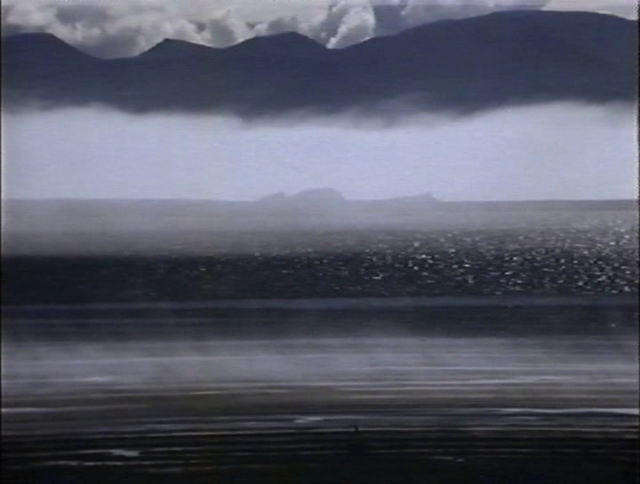 His worked followed and shifted focus, most notably with his masterpiece of landscape photography In Titan’s Goblet (1990) which placed its emphasis almost entirely on the natural world. The title derives from painter Thomas Cole’s Titan’s Goblet, the concept being that if you could peer into Cole’s allegorical cup of demi-gods, you might find the majesty of the Hudson therein – certainly, few landscapes would qualify as well as the Hudson in terms of awe-ful might. 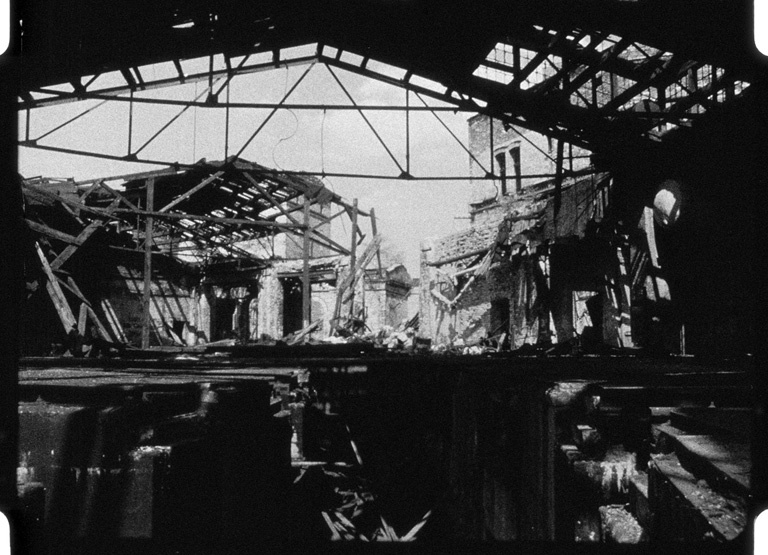 Hutton’s films brought a bit more beauty into a world that never has enough of it. As his work progressed, the prominence of awe and majesty continual rose in relationship to that beauty. 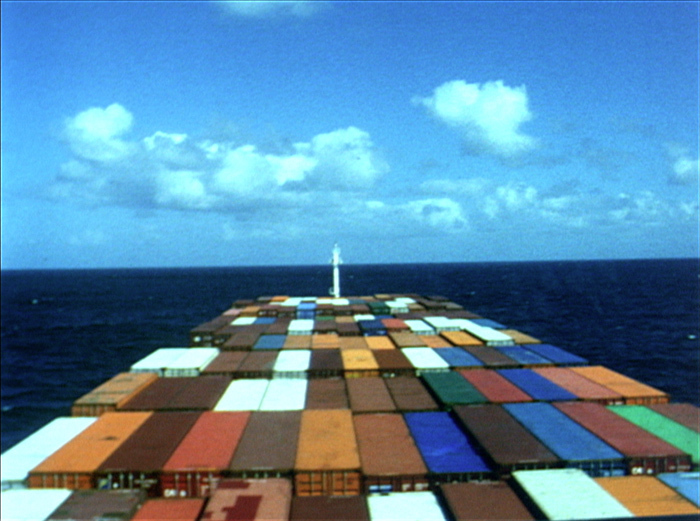 It would not be unreasonable to be overwhelmed by the beauty of At Sea (2007), which follows the construction and life of a massive container ship, a film that is the natural culmination of his work. It blends the breath-taking awe of his landscape photography with his appreciation of industrial titans, a collision of natural and man-made wonders, the over-whelming Bigness of the world (even the world of our own creation), the uneasy harmony of natural might and man’s awesome ambition. The beauty of the world is that it is too much and night falls, that if we were to look in a Titan’s goblet the wonder and terror of it would be too much. But the Bigness of Hutton’s work was only for scale. His films pointed out from the human scope – if Titan looked in his own goblet, he likely wouldn’t be impressed. Hutton’s work is human and approachable (approachable because it is human, of course.) And maybe its most human insight is that beauty belongs to humanity. Titan doesn’t consider his own goblet and the ocean does not consider its own majesty. The beauty is for us and us alone. There is a massive river, furrowed into a mountain over the course of millennia, that cuts through New York State, cuts through our cities and highways, rolls under our bridges suspended hundreds of feet in the air. Earlier this week Peter Hutton passed away in a hospital less than a hundred yards from that river, a hospital just beyond one of those roadways of steel-and-concrete suspended between cliff-faces. Peter Hutton’s work brought a bit of beauty into this world that wasn’t there before he was born, a beauty that required a birth because it was a human in nature. Beauty discovered amidst rivers and cloudbanks and oceans and skyscrapers and gods, beauty so small even Saskia could understand it.